Sonny Perdue: Parental notification for minors. Larry Kudlow: Trump's support of late-term abortion ban is "gift from god". Larry Kudlow: FactCheck: No, deficit is increasing with Trump tax cuts. Linda McMahon: Reduce financial regulations so small businesses get capital. Wilbur Ross: SEC investigating insider trading "short sale" of oil stock. Elaine Chao: Reckless tax and spend strategy is hazardous for economy. Jeff Sessions: 1986: Lost appointment for racially insensitive comments. Linda McMahon: Longtime advocate for women in leadership and business. Betsy DeVos: Rescind "weaponized" use of sexual misconduct accusations. Ben Carson: Scrap HUD tool for racial discrimination in public housing. Sonny Perdue: Call on legislature for Constitutional ban on gay marriage. Betsy DeVos: Served as chairman of investment firm The Windquest Group. Daniel Coats: Pro-growth economic policies to put Americans back to work. Jeff Sessions: Establishment conservative: opposed 2008 bank bailouts. Linda McMahon: Give entrepreneurs the tools they need to start & succeed. Linda McMahon: Grew WWE from 13-person company to 800 employees worldwide. Mick Mulvaney: Ran family real estate business & family restaurant. Steve Mnuchin: Partner at Goldman-Sachs; board member at three art museums. Wilbur Ross: 55 years of investment banking and private equity experience. Wilbur Ross: Privatization adviser to New York City Mayor Rudy Giuliani. Elaine Chao: Public-private partnerships for innovating on infrastructure. Elaine Chao: Reform corporate tax code to reward offshore tax havens. Wilbur Ross: Alleviate corporate tax rate; small break for lower earners. Betsy DeVos: Require cross-examination of victims of sexual harassment. David Shulkin: VA research of marijuana restricted by federal law. Ben Carson: Carson Scholars Fund: $7M in scholarships. Betsy DeVos: Mother was public school teacher; Betsy was in-school mentor. Betsy DeVos: Use federal funds for private schools for military kids. Betsy DeVos: Contributes to education to advance "God's Kingdom". Rex Tillerson: At Exxon, rose from production engineer to president. Ryan Zinke: Increase coal, oil & gas mining access at National Monuments. Ryan Zinke: Public lands opened for private company energy development. Rick Perry: Simultaneous economic growth & environmental protection. Ryan Zinke: End ban on lead bullets & fishing tackle in wildlife refuges. Sonny Perdue: Responsibility is to leave the land better than we found it. Mick Mulvaney: You can't drain the swamp and leave all the people in it. Elaine Chao: Environmental regulations create roadblocks and delays. Rex Tillerson: National President of the Boy Scouts from 2010 to 2012. Daniel Coats: China's goal is global superiority, including militarily. Daniel Coats: China grows by investment; Russia by misdirection. Daniel Coats: Criticizes government censorship & social controls in China. Daniel Coats: China holds 1M Muslims in "patriotic re-education" camps. Sonny Perdue: Promote agricultural interests to international markets. Sonny Perdue: Tariffs on China are painful now, but healthy later. Steve Mnuchin: Free market proponent but tariffs OK to reduce trade deficit. Sonny Perdue: Helped save NAFTA by showing Trump red state farmers need it. Steve Mnuchin: Gun violence is tragedy and policy needs to be addressed. Sonny Perdue: Legalized concealed weapons on public transportation. Steve Mnuchin: Repeal ObamaCare individual mandate for middle class tax cut. Tom Price: Premise of ObamaCare is that Washington knows best. Tom Price: Practicing orthopedic surgeon before entering politics. David Shulkin: The VA is just as good or better than private health care. Wilbur Ross: Young, healthy people enrolling in Obamacare is illogical. Daniel Coats: 1980s & 1990s: strengthen our national defense and security. Rick Perry: 1970s: flew C-130 tactical airlift aircraft in Air Force. Sonny Perdue: Food security is a key component of national security. Wilbur Ross: Invoke national security to restrict imports on uranium. David Shulkin: A voluntary military might not work without good VA care. Elaine Chao: Immigrated to America at age 8; gained citizenship at age 19. Wilbur Ross: Citizenship on census vital to enforce Voting Rights Act. Larry Kudlow: Zero immigration till new system to stop ISIS is implemented. Elaine Chao: Legality at the heart of immigration policy debate. Daniel Coats: Founded charity, The Foundation for American Renewal. Mick Mulvaney: Lifelong Carolinas resident; graduate of UNC-Chapel Hill. Mick Mulvaney: Founding member of Our Lady of Grace Catholic Mission. Rick Perry: Longest-serving governor In Texas history. Tom Price: Accused of insider trading; resigned due to travel expenses. Larry Kudlow: Market's higher return trounces Social Security's low yield. Steve Mnuchin: Focus of Presidential budget is not cutting entitlements. Larry Kudlow: Never believe the CBO: tax cuts will not increase deficit. Steve Mnuchin: Implemented Trump's "Tax Cuts and Jobs Act". Steve Mnuchin: Bypassing congress to cut taxes on capital gains possible. Elaine Chao: Chao family foundation funds funneled into offshore firms. Steve Mnuchin: Mathematically impossible to avoid tax cuts on wealthy. Betsy DeVos: DeVos record includes advocating for tax cuts for the rich. Daniel Coats: Russia abuses social media in anti-democracy information war. Wilbur Ross: Space race to stimulate economic growth across industries. Elaine Chao: Specialized in transportation financing in private sector. Elaine Chao: Slow permitting process blocking private sector investments. Donald Trump: Russia violates the Intermediate-Range Nuclear Forces treaty. Mike Pompeo: Withdraw from INF to counter Russia and China. Daniel Coats: North Korea views nuclear weapons as critical to survival. Daniel Coats: Iran escalating wars in Yemen and Syria, but not nukes. James Mattis: Led Marines in Iraq, Afghanistan, and overall Mideast. James Mattis: Resigns in wake of announcement of withdrawal from Syria. John Bolton: Abrogate the Iran nuclear deal; encourage Israel to attack. Mike Pompeo: Negotiate from strength to denuclearize North Korea. Elaine Chao: Restored trust as CEO of United Way of America. Larry Kudlow: Be tougher on spending, including entitlement reform. Ben Carson: Eliminate income-based rent increases in public housing. Ben Carson: Cycle people up and out of public housing developments. 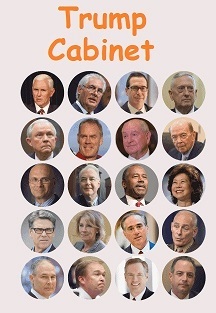 The above quotations are from Trump Cabinet members actions and issues. All the Best, My Life in Letters, by George Bush Sr.